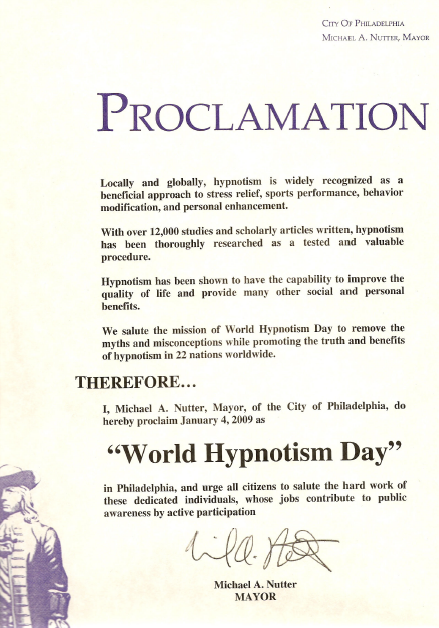 I’m pleased to announce that the City of Philadelphia has chosen to join governments around the world by recognizing January 4th 2009 as World Hypnotism Day (WHD). WHD is a collaborative effort involving hypnotists from around the globe, dedicated to removing the myths and misconceptions while promoting the truth and benefits of hypnotism. Because hypnotism is such a wonderful tool for helping people become healthier and more productive, World Hypnotism Day fits in well with the ongoing efforts of the City to make Philadelphia a healthier city. Pictured is the City’s Manager of Commercial Development and Attraction, and me, Steve Roh, owner of Center City Hypnosis. I’m happy to accept this declaration on behalf of all the hypnotists in the area who are working to help others help themselves thru the power of hypnosis! To learn more about World Hypnotism Day, please visit www.WorldHypnotismDay.com. PS. Stay tuned to find out about our upcoming WHD event, remember that date Sunday January 4 2009! To learn more, visit the main website at http://www.centercityhypnosis.com. World hypnotism day, at least there’s a state that honor and recognize the least recognize field of science… I salute you!